This October, the Duffy Marketing team will raise money for those affected by breast cancer. It’s a win-win situation. Catch Me In Pink™ will help raise funds and awareness for the Vera Bradley Foundation for Breast Cancer. for one of our great prizes. 6. No Facebook? That’s ok - email the picture and contact information for everyone in the picture to be registered and we’ll post it for you. Everyone in the picture must be identified to validate the entry. 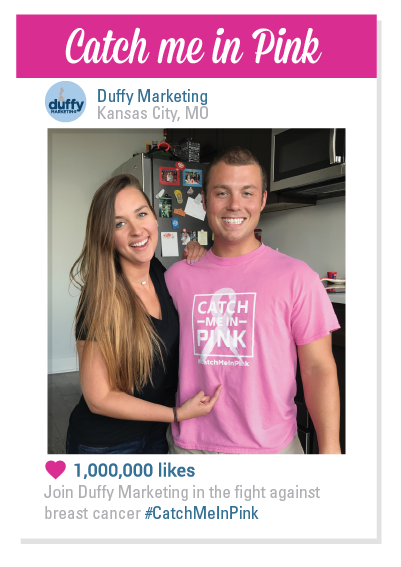 For every #CatchMeInPink pic we post, Duffy Marketing will make a donation to the Vera Bradley Foundation for Breast Cancer. for two to a beautiful Caribbean island! Additionally, you could be one of our 3 Facebook winners. Wednesday 10/17, 10/24 & 10/31. The sooner you take an #usie, the greater chance you have to win. Pack your bags! This could be you. Tootie Reed (Fort Wayne, Indiana) from Masters Heating & Cooling was last year's tropical trip winner. Tootie really upped the game with a whopping 154 Facebook #CatchMeInPink posts. Her outstanding efforts resulted in Masters Heating and Cooling donating $5,000 to the Vera Bradley Foundation For Breast Cancer. Tootie is also a breast cancer survivor! Catch Me In Pink™ generated thousands of dollars last year with help from people just like you! If you or your company would like to participate this year, we would be honored to have you join in our efforts. No company? No problem! Donate $10 to the Vera Bradley Foundation for Breast Cancer and receive your official PINK t-shirt. Hitting submit will redirect you to PayPal to process your donation. Orders must be completed before 10/15/2018.